A fire sparked by battles between Syrian President Bashar Assad's troops and rebel fighters tore through Aleppo's centuries-old covered market Saturday, burning wooden doors and scorching stone stalls and vaulted passageways. The souk is one of a half-dozen renowned cultural sites in the country that have become collateral damage in the civil war. The Aleppo market, a major tourist attraction with its narrow stone alleys and stores selling perfume, fabrics and spices, had been the site of occasional gun battles and shelling for weeks. But amateur video posted Saturday showed wall-to-wall flames engulfing wooden doors as burning debris fell away from the storefronts. Activists said hundreds of shops were affected. "It's a big loss and a tragedy that the old city has now been affected," Kishore Rao, director of UNESCO's World Heritage Center, told The Associated Press by telephone from Paris. Most of the other sites recognized as heritage sites by UNESCO, the global cultural agency, are also believed to have suffered damage during the 18-month battle to oust Assad, Rao said. The ancient centre of Aleppo — Syria's largest city — has been hit the hardest, he said. "It is a very difficult and tragic situation there," said Ahmad al-Halabi, a local activist speaking by phone from the area. He said rebels and civilians were trying to control the blaze, but only had a few fire extinguishers. On Thursday, rebels launched what they said would be a "decisive battle" for the city, followed by days of heavy fighting, including shelling and street combat. Amateur video has shown rebels taking cover behind walls and makeshift barriers, attacking regime forces with grenades and assault rifles. Activists reported heavy shelling by pro-Assad troops. It's not clear what set off the fire in the old market, made of hundreds of stone stalls that line covered alleys with vaulted ceilings. Amateur footage posted online by activists showed flames engulfing the shops and rebels aiming a water hose at the fire. The shops' wooden doors, along with the clothes, fabrics and inside some of the businesses, helped fuel the blaze, activists said. The market stalls lie beneath the city's towering 13th century citadel, where activists say regime troops and snipers have taken up positions. The Syrian conflict has killed more than 30,000 people, according to activists. It has also wreaked widespread destruction, particularly in recent weeks as regime forces stepped up air strikes and shelling attacks, and rebels fired mortar shells and rocket-propelled grenades. Entire neighbourhoods in Syria's three largest cities — Aleppo, the capital Damascus and Homs — have been devastated. A majority of Syria's 23 million people live in a thin western sliver of the country; in this territory, rebels have established positions in rural areas, while Assad's forces are trying to hold on to the cities. Aleppo's old centre was added in 1986 to UNESCO's list of World Heritage sites. Of the medieval souks in the Middle East, Aleppo's was among the best-preserved, offering visitors a range of architectural styles covering hundreds of years, said Rodrigo Martin, a Brussels expert on Syrian historical sites. 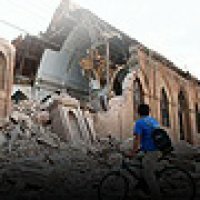 "It was a unique example of medieval commercial architecture," said Martin, a spokesman for a group of experts who monitor damage to Syrian historical sites and co-operate with the U.N. cultural agency. Some of the other prized cultural attractions have also suffered damage. Earlier this year, looters broke into Crac des Chevaliers, one of the world's best-preserved Crusader castles, a Syrian antiquities official said at the time. Shelling also damaged the site, said Martin, citing amateur video. The ruins of the ancient city of Palmyra were damaged by fighting, Martin said, according to reports he received from Syria. He said he had seen video that showed sculptures being taken away from Palmyra in a small truck. The other World Heritage sites on UNESCO's list are the old centre of Damascus, one of the most ancient cities in the Middle East; the ancient city of Bosra, once the capital of the Roman province of Arabia; and a group of some 40 villages of north-western Syria that date from the first to seventh centuries. Rao, the World Heritage chief, said the U.N. agency has asked Syria's neighbours to be on the alert for attempts to smuggle looted objects out of the country. No incidents had been reported so far. Lesser sites have also been affected in Syria. Regime shelling of neighbourhoods where the opposition is holed up has smashed historic mosques, churches and souks in the central Homs province and elsewhere in the country. Looters have stolen artifacts from museums. Martin said the Syrian regime bears the bulk of the responsibility for the destruction because it signed international agreements to protect cultural sites. For at least two millennia, cultural sites have been threatened or destroyed by wars throughout the Mideast, Martin said. "History continues, whatever we do," Martin said. "Mankind can just be really destructive."